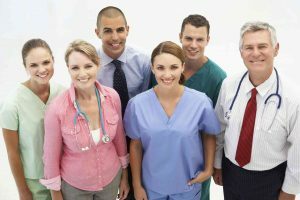 5 Corporate Strategies that are Supported by Uniforms | Ace Uniform Services, Inc. Your company uniforms can help support your corporate strategies and lead to success. Every business has a set of corporate strategies that are crucial to their overall success. While uniforms have been recognized for their ability to help increase worker productivity and camaraderie, companies are also implementing them as a way to drive home their key corporate strategies. Here are 5 major corporate strategies that your business uniforms can help support. Uniforms are an easy way to promote your brand and make your team easily identifiable. Whether at work or at an event, employees wearing the company uniforms create and emphasize brand presence. Customers will know exactly who to go to when they need assistance. We’ve already discussed before how company uniforms can build a positive, egalitarian work environment. Team members are usually happier when treated equally among their peers and this, in turn, raises morale and leads to higher retention rates. So if one of your core corporate strategies is the idea of a strong team, company uniforms are a must-have. Safety is a key concern for all businesses. Your company uniforms always need to be up to the standards of whatever industry you’re involved in. While a lot of people recognize the brand aspect of a uniform, the safety aspects can get overlooked. For example, in the construction industry, safety is promoted through the standardization of brightly colored and reflective uniforms, and they are required by law whenever workers are in the presence of traffic or heavy machinery. Companies that have hazardous or secure areas need an easy way to determine visually whether or not a person ought to be in these areas. When all employees are dressed in a standard uniform, it becomes very easy to see who does and does not belong in your secure areas. This entry was posted on Wednesday, December 21st, 2016	at 2:54 pm	. You can follow any responses to this entry through the RSS 2.0	feed. Both comments and pings are currently closed.